Did the weather get the memo? It is supposed to be Spring! With lows in the 30s and highs in the 50s one day and highs in the 70s the next, what is a girl to wear? Officially, the season changed. Plants are blooming and grass is sprouting and other signs of warmer weather abound, but we can’t shed the layers just yet. I mean you can if you want to shiver as you walk into the office and even there you may be a little chilly because most likely they have the air on. Since I am so ready to start wearing cute warmer weather looks, I had to think of something that looked springy but also kept me warm. 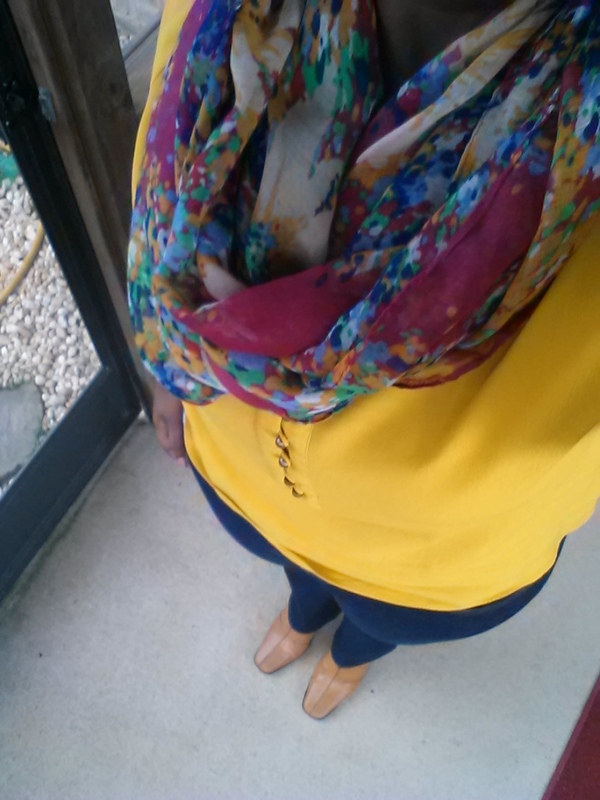 I opted for a basic look – dark jeans, blouse, leather jacket, scarf and booties. But what blouse, scarf, jacket, and shoes? I opted for a 3/4 sleeve blouse. It isn’t as restrictive as a long sleeve blouse that traps in heat but it keeps you warmer than short sleeves or no sleeves. The color was a factor in the blouse choice too. The vibrant gold mixes well in all seasons. 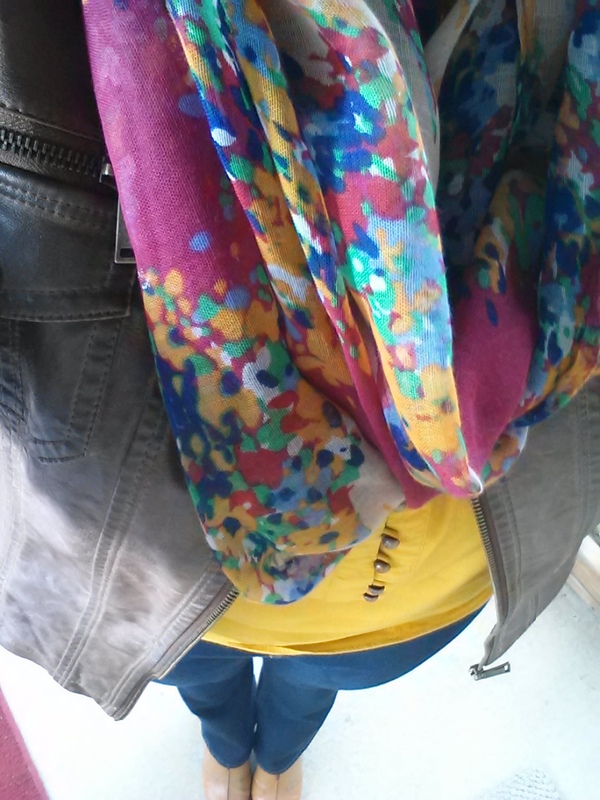 With all the painter colors in the scarf, it screams Spring. The lightweight fabric is essential to adding a scarf to your wardrobe as the temperatures rise. The jacket adds warmth to the look but the muted brown makes it look less winter-like. Are you confused on what to wear during this transitional time? Or have you mastered this weather and created some great looks that are Spring like and warm? Comment, like, and post your pics so I can see what you are wearing, during these crazy weather times! Nordstrom Rack is one of my favorite places to shop!!! Super cute outfit! Transitional pieces can be so hard when the weather is finicky! Mine too! Yes It is challenging.